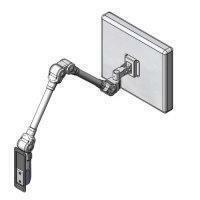 Wall mount slim foldable arm(model #60226-40D series wall mount slim foldable arm) - Sallas Industrial Co., Ltd. 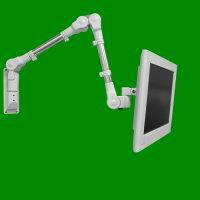 This wall mount slim foldable arm is designed to be lightweight, of high quality appearance and competitively priced. The design incorporates display tilt and rotation adjustment. Ruggedly constructed from steel arm parts with smooth operation performance and provision plastic clip for cabling. Fore arm height adjustment from horizontal plane down to 80° and back arm height adjustment from vertical to horizontal plane. Arm side to side rotation and 360°. Counter force balanced monitor tilt 90 degree up or 25 degree down.